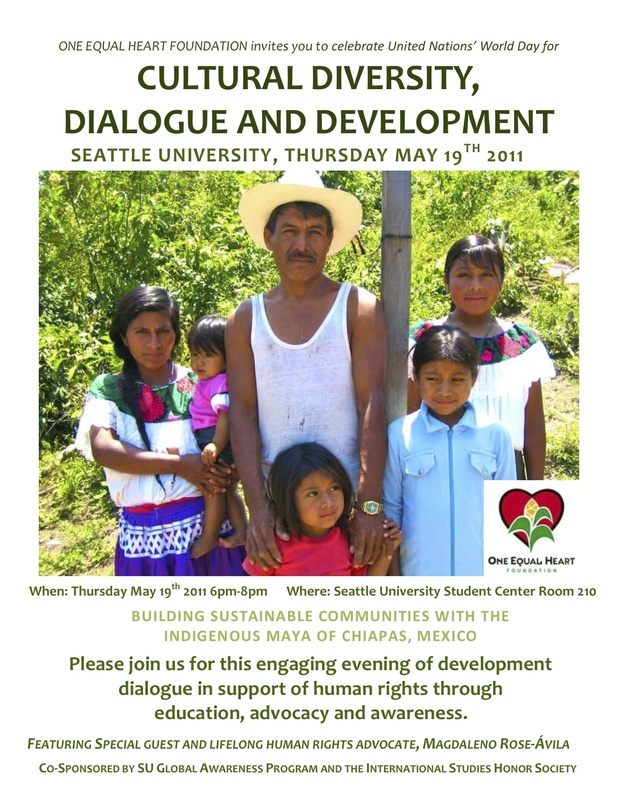 In celebration of UN World Day for Cultural Diversity for Dialogue and Development and their recently returned delegation to Chiapas, Mexico, One Equal Heart Foundation is holding an event at Seattle University on Thursday, May 19th. I appreciate One Equal Heart for giving us an example of an organization that exemplifies how small NGOs can demonstrate within their structure the equality for which they are working. A few years ago, the inspirational Mariah Ortiz asked me to define Collaborative Social Change, a term that I was using to describe small NGO partnerships working across cultures. I had come to believe that we needed a new way of thinking about two communities in different parts of the world working together. It is one thing to work together against poverty, but what are we then working for? A better society that is less hospitable to poverty, and that is achieved through social change, right? Since only the society being changed can drive that change if it is going to stick in the long run, our relationship with them is as collaborator and partner. Social change that occurs through the shared labor of two or more entities working in a relationship of equality, leveraging their unique resources, experiences, skills, or ideas to yield an outcome that significantly impacts society. Global economics impacts the lives of the poor. In the Sacred Book of the Maya, corn is fundamental to the cultural identity of the Maya who call themselves the “People of Corn.” Corn is also the dietary staple and primary source of calories for the Tseltal Maya, and most families are subsistence farmers whose source of food is what they can grow on their land. A variety of factors, however, are threatening the existence of native corn, for example NAFTA, biofuel-driven mass cultivation of African Palm over food crops, and genetically-modified/engineered seeds. Poverty is complicated, with interconnected strands woven together like a vibrant Mayan K’ul (or Huipil in Guatemalan Mayan). In the Mayan world, harmony is achieved by balancing the needs of the individual, marital couple, family, community, and environment. This balance is delicate, dependent on social, political, economic, and judicial structures that interconnect around it. Mission/ CEDIAC partners talk about sustainability in terms of health, with three concentric circles. Individual and family health relates to the conditions we need for our physical health, including access to medical care and a predictable nutritious diet so we grow to our full potential. Environmental health includes clean air and water, healthy soils to support sustainable crops, and ecological strategies to live in harmony with the land, animals and plants. Lastly, social health involves a situation in which people’s human rights are respected. They have access to decent education and a way to make a living, and they do not live in fear of violence or displacement from their ancestral lands. The work in Chiapas approaches sustainable development as a holistic and multi-dimensional process. Only by nurturing the whole can individuals live in harmony. Conflict is best resolved through compromise and consensus around a collectively agreed upon solution. Recognizing that it is not sustainable to simply punish perpetrators in cases of conflict, the Tseltal Maya Juridical System resolve conflicts by focusing on ways to engage the parties in dialogue. Restorative Justice challenges all involved to mend relationships and search for harmony as a fundamental requirement for our collective survival. As development fads come and go, One Equal Heart’s partners have evolved their work over fifty years, demonstrating a long-term commitment through dynamic social shifts that have affected the lives of poor Chiapans. Many organizations make passing reference to “participatory management” or “locally-driven social change.” OEH and its partners model how two communities can partner in work for social change here and there. Capacity building: A majority of Mission/CEDIAC staff members are Tseltal Maya; every director who is not Tseltal is partnered with a Tseltal, and these two staff members work side-by-side implementing the work of their position. No one works solely in the office—even the Administration and Finance Team. All have field work that puts them directly in contact with the Earth and Tseltal communities. Community investment: The Tseltal Maya have a pre-existing system of cargos, or volunteer leadership posts, for carrying out the work that benefits the social good. The Mission/CEDIAC staff draw on this system as they reach far beyond where staffing has capacity to go. Local wisdom: Development of an indigenous college would keep young people local and decrease the number of Chiapans who migrate to other parts of Mexico and the U.S. in search of work. Mission/CEDIAC staff members have created a model for higher education that partners young and old in order to temper the energy of the youth with the cultural wisdom of their elders. Equal partnership: OEH board and staff developed a bi-cultural strategic plan that bridged together the opportunities and concerns of partners in the U.S. and Mexico. A Mission staff member recently shared an anecdote about poverty alleviation in Chiapas. One town in Chiapas was the third poorest in Mexico, according to a range of indicators examined by government officials. In the aftermath of the Zapatista rebellion, the government decided to address the poverty that was causing civil strife and invested heavily in infrastructure projects. The government paved roads and installed concrete floors in the homes of the poor. The result? The town became the second poorest town in Mexico. (Indeed, other projects purporting to benefit the poor have the opposite effect, separating impoverished Maya from their ancestral lands.) The indicators used by the government had little to do with the reality of poverty, and outside investment had the unintended result of drawing resources away from the area rather than investing in local solutions. One Equal Heart and its partners in Chiapas use a Jesuit term, accompaniment, to describe their collaboratory work. We and they are walking, talking, and laboring together for a better world—with one equal heart. This entry was posted in local leaders, non-profit management. Bookmark the permalink.